I think the battle would be astounding. Not really able to say who would win. I think that that Ms Marvel would win because I think that she is harder and willing to fight to the end. I decided to stage a fight in MUGEN. 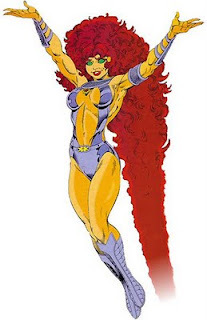 I think Starfire would win. In the comic books she was trained since childhood to be a warrior. She used to kill every enemy in her sight before she get into the Titans. Of course, Ms Marvel is a soldier but she's not as violent as Starfire.